Being a crafty type I wanted to post some DIY ideas for making your wedding look unique. So here is the first of my DIY Wedding Kits …. Knitted Letters! If you’re constantly wanting to do things towards your wedding, then this is perfect for you. It will all fit neatly inside your handbag and you can do it on the train, in the car (not while driving!) and even while watching the telly when you get really good. I found the pattern at http://www.knittingknonsense.com/index2.html which has letters, numbers and even animals and countries. Although they take a fair amount of concentration (and maybe 3 hours to complete) you don’t need to be an expert to knit them. All you need to be able to do is; cast on, knit, purl, and cast off. If you can’t do that yet you can probably pick it up in a few lessons with your gran (as I did) or check it out on youtube. You may be thinking ‘what has knitting got to do with weddings?’, but there are lots of places you can use these little squares. What about knitting yours and your partners names to put above the seating plan, or to make a ‘JUST MARRIED’ sign to hang on the back of the bridal car. The great thing about it is that it will last for years and years, and you could even pass it down to your children for their wedding day. 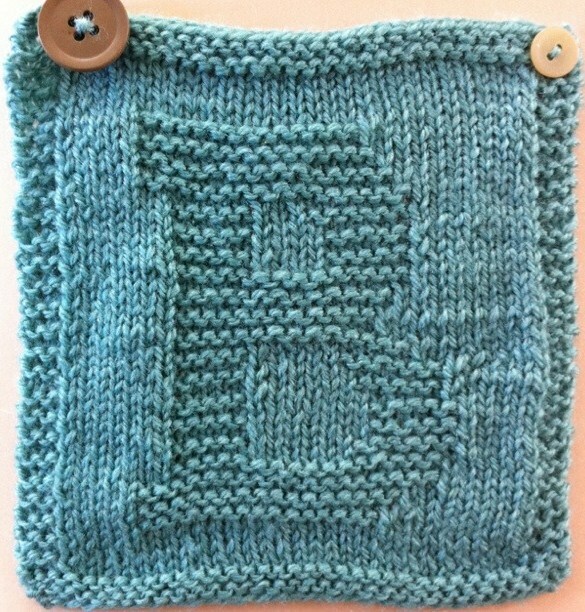 The squares are very versatile, you can knit them in virtually any size you like, so could be made into a variety of favours. How about knitting your bridesmades initials and sewing them onto cushions or using them to cover photo albums or books. Once you’ve got your thinking cap on the list will be endless! As decoration or as gifts these would give a personal touch to any wedding, whatever way you decide to use them.